Form 15G and Form 15H can be submitted online with a click of a button. No physical visit to bank is required for submitting Form 15G or Form 15H. You must be aware that TDS is applicable on fixed deposit interest income. If your income is less than basic exempted limit you can submit the Form 15G or Form 15H to save TDS on fixed deposit interest. Big banks like ICICI and SBI offers this facility online. You just need internet banking facility and internet connection to submit Form 15H or Form 15G online. What is Form 15G, Form 15H? Form 15G and Form 15H are forms helps a person to avoid TDS in case ones tax liability is NIL. Form 15G is for Individual with age less than 60 years and Form 15H is for senior citizens. Depositor having interest income above basic income tax slab will not be able to submit the 15G/15H form. This form needs to be submitted every year. This means in last financial year if you have submitted this form you need to submit it again in a current financial year. This form needs to be submitted to every bank or company from where you have taken a fixed deposit and interest income is above Rs.10000 in a year. Any type of wrong declaration using form leads to penalty including imprisonment. 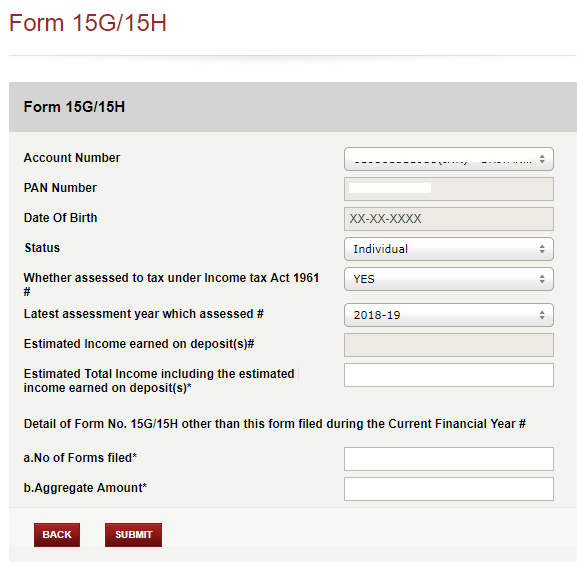 How to submit Form 15G Online at ICICI Bank? Log in to ICICI Bank Internet Banking with your User ID and Password. 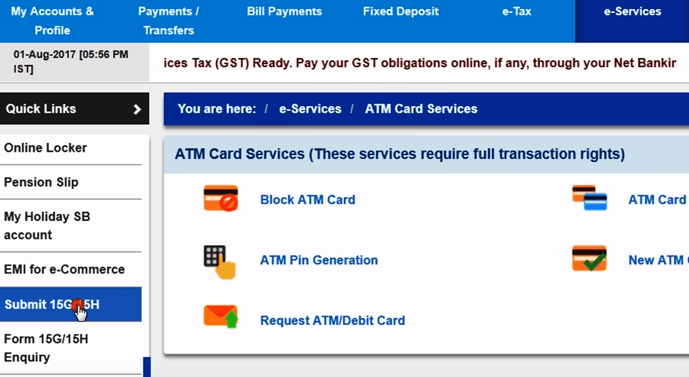 From Top navigation menu Select “Payments and Transfer” and click on Tax Centre. Fill or select necessary details like account number, status etc. Now input your estimated total income including the estimated income earned on fixed deposit. Also, provide details such as No of forms filled including forms given at other places. Recheck the information given on confirmation page and click on submit button. Download Acknowledgment for future reference. Also, note down service request number. It will help you to check the status of your service request. 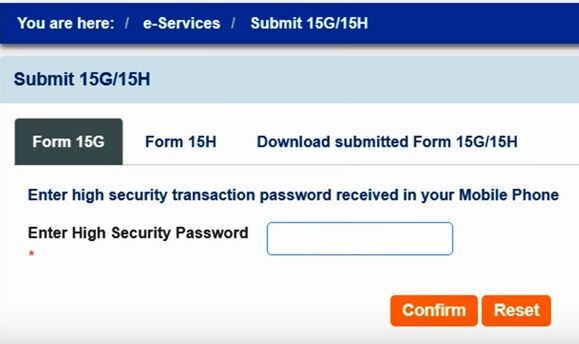 How to submit Form 15G Online at SBI? First Login to SBI net banking portal using your net banking credentials. From top navigation, select “e-Services” option. From left side navigation you will be able to see Submit 15G/H option click on that. Select Form 15G or Form 15H based on applicable condition. Select CIF number and click on submit button. System will show branch selection option. Select branch and press submit. Now the form will open asking you information like Name, Assessment Year, Estimated total income, Total number of form filed. Provide appropriate information, select declaration acceptance and click on Submit Button. Form 15G/H will be generated for verification. Click on confirm. You will be prompted to provide High-security password received on registered mobile as SMS. Provide the password and click on confirm button. That’s it your Form 15G/H is generated and submitted to the bank. Keep Download copy of this form as a reference. I hope now you are clear about the process of submitting Form 15G or Form 15H online. If you have any query feel free to post it in the comment section. « One Member One EPF Account – How to Transfer EPF Account?